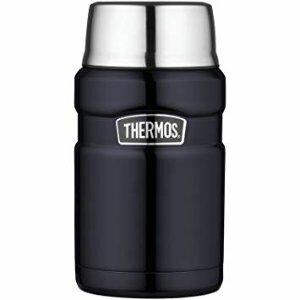 Amazon.com offers Thermos Stainless King 24 Ounce Food Jar for $18.99. Walmart has the same offer. Features: Thermos vacuum insulation technology for maximum temperature retention, hot or cold, keeps liquids hot for 14 hours and cold for 24 hours, package may vary. Durable stainless steel interior and exterior. Cool to the touch with hot liquids, sweat proof with cold. Compact and insulated stainless steel serving bowl. Wide mouth is easy to fill, eat from and clean.